720 University Place, formerly known as Music Hall, was built in 1897. This building was built in the 1890’s and was originally used as a music hall for an all-women’s college. Before starting this project, each masonry unit had to be carefully examined to determine how many replacement units were needed. 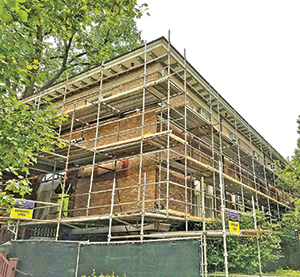 The 12,000 square feet of exterior wall surface of the building has a wide range of brick colors, surface deterioration, changes to brick texture due to exposure, and brick sizes. Additionally, the structural masonry was a rough-cut, locally quarried stone that was cut a long time ago, with archaic equipment that is not likely in use today. Berglund Construction took great care to blend the masonry units and matching the color and texture of the repointing mortar. 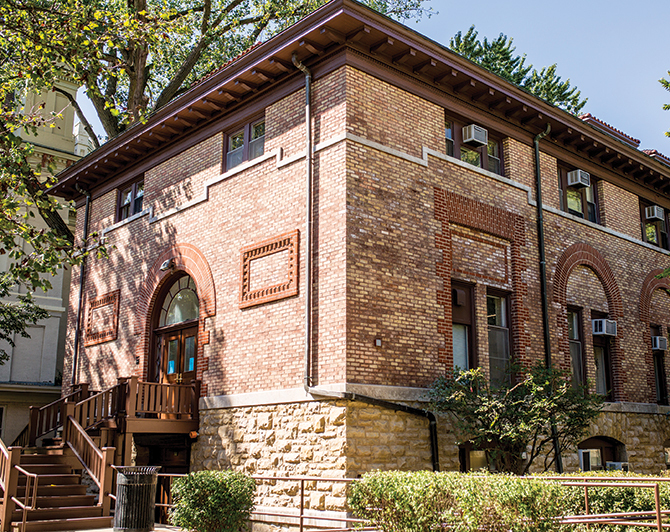 Berglund Construction, under BTL’s direction, restored it to its original splendor by using the reclaimed brick and age-old tuck-pointing techniques. All old repair mortars were removed by mechanical wet grinding so as not to expose the workers to any airborne hazards. The mortar was then replaced with the three original colors using a beaded finish joint, which would have been used in the original construction. Any deteriorated brick was removed and replaced in kind with reclaimed brick matching originals. High performance paint colors were selected based on period photos, which further enhanced the original historic look. 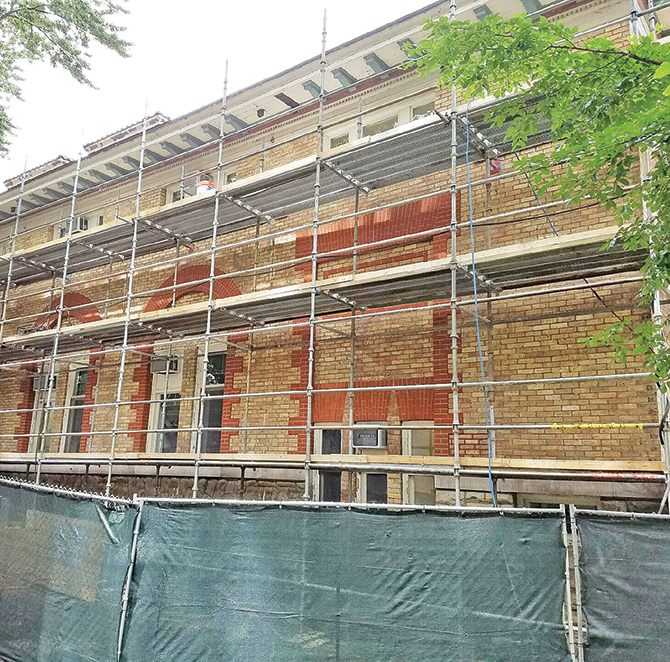 Since much of the historic mortar joints proved durable for many years prior to the restoration, careful planning was needed so the repointing would have an equally long life, and ultimately contribute to the preservation of the entire building. During the restoration phase, the building was kept occupied and functional. Many of the more intrusive repairs were made during off hours and on weekends. During the restoration phase, the building was kept occupied and functional. Many of the more intrusive repairs were made during off hours and on weekends. Little by little, layers of dirt and deterioration were peeled away to reveal the craftsmanship of yesterday that had been hidden. 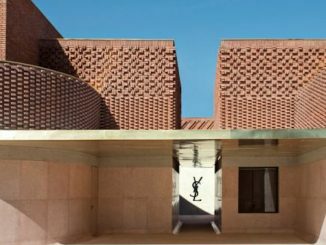 Replacement units were blended in with the full range of masonry units rather than in separate brick or stone sections. Additionally, the original wood cornice was restored and many wooden elements were replaced with reclaimed wood that was fashioned to replicate the originals. Experienced masons understand the special requirements needed to work on historic buildings and the additional time and expense they require. Berglund Construction took great care to blend the masonry units and matching the color and texture of the repointing mortar. This re-pointing job can last at least another 30 years, and possibly as many as 50 to 100 years. Excerpted from the Northwestern University Planning Study of Lutkin Hall and 720 University Place by Ann Beha Architects, Nov. 23, 2016. 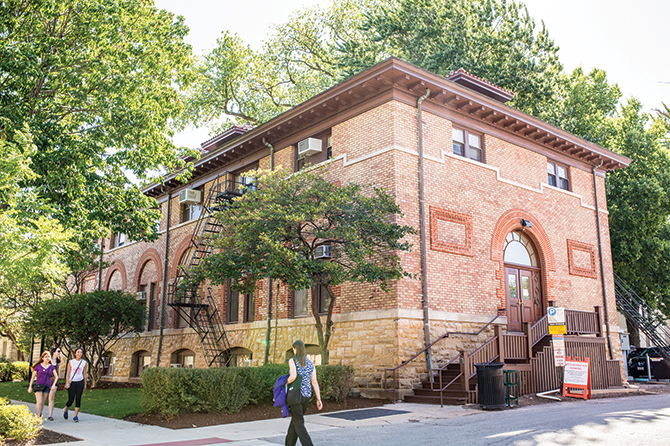 720 University Place, formerly known as Music Hall, was built in 1897 to house the new School of Music at Northwestern University Woman’s College. Designed by the prominent Chicago architect, William Augustus Otis, the three-story building was built in the Romanesque/Italianate style with multi-colored brick above an ashlar stone base. Originally, Music Hall was built with a 350-seat concert hall at the top floor—a large flat floor auditorium with fixed seating, highlighted by exposed timber trusses and a manual pipe organ atop the wooden stage. Today, that floor has been given over to open workstations that support the University’s Human Resources Department, which moved into building in 1977, and also occupies offices on the other two floors. Northwestern University Woman’s College established a Conservatory of Music in 1891, naming Peter Christian Lutkin as its director. In 1895, the Conservatory became the School of Music with Peter Christian Lutkin as its first dean, and Music Hall, now known as 720 University Place, was built in 1897 to house the new School. The new building was built directly to the north of the Women’s College Building, which was built in 1874 and became the Music Administration Building for the University in 1940. In 1941, construction began for Lutkin Hall immediately to the east of Music Hall, and the architect of Deering Library, James Gamble Rogers, was called on to design this recital hall. 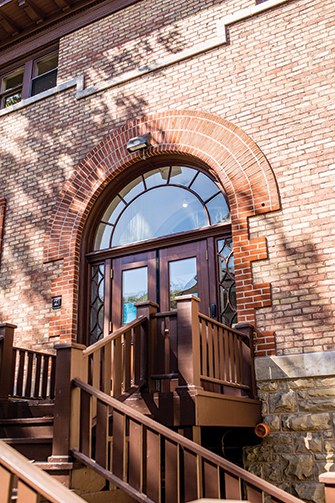 When the building was opened, it hosted a series of dedicatory concerts featuring the University String Quartet, the Evanston Musical Club, and the School of Music Orchestra, with receptions on the lower floor. The top floor also included dressing rooms and classrooms, and the first floor contained the Dean’s office, the business office, a reception room, and practice rooms. 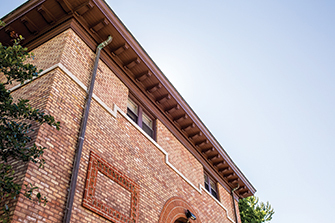 To meet the School’s quickly expanding needs, the lowest floor of Music Hall, which was originally built as the gymnasium, was subdivided into 11 rooms just two years after the building was opened. Music Hall was built with its main entrance facing east. The Romanesque/Italianate building is built in multi-colored brick, and a salmon-colored mortar. The ashlar base of the building is made of rough, grey-colored stones, capped with a dressed limestone water table forming the sills of the windows on the main floor. The east and west facades have pairs of double doors for the entrances at the main floor, and two pairs of double windows on either side of the entrances at the upper floor. There also are entrances to the lower floor, below the main entrance doors, on both facades. The long north elevation of the building faces the street with six pairs of double windows at the main floor set into tall reveals lined with red brick. The upper floor has six sets of smaller ganged windows with a limestone still that extends around all sides of the building to form a belt course of stone. The lower floor has six sets of smaller ganged windows in reveals topped by a segmental arch. 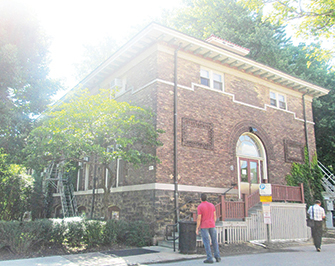 The hipped roof is covered with rounded, red clay tiles, as are the hipped dormers on either ends of the building and the pair of dormers on the north and south sides. The roof has a deep overhang, supported by decorative wood brackets. 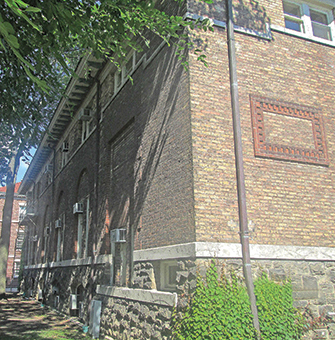 The main level of the building has a double-loaded corridor with offices on either side that are largely in their original configurations and with original partitions. The corridor has a high flat ceiling that is punctuated by four, three-centered arches along its length. The lower floor also has a double-loaded corridor with offices on either side of the corridor. The corridor walls at this level have been built around structural trusses that have the bottom chord exposed in the corridor and offices. The upper floor, formerly the concert hall, is now occupied by open workstations. The structural trusses are exposed and feature stained wood clad timbers and dark painted steel chords and brackets. The original stage and rooms at the west end of the floor were removed in a 1980 renovation, and the ceiling areas between the trusses were insulated and covered with acoustical tiles. The rooms at the east end of the floor had been converted to offices and conference rooms, and they were renovated again in the 1980s. An open, wood monumental stair connects all three floors at the east end of the building. On the west end of the building, a smaller wood stair was modified in 2012 to remove the section of stair from the basement to the main floor.